Conducted in an intensive care unit at Salem Hospital, this study looks at non-pharmacological interventions to reduce ICU-associated delirium. Tangles are used among other non-pharmacologic interventions as activity engagements during daytime hours for patients with dementia and acute delirium. Australian Journal of Learning Difficulties, Vol. 15, No. 1, May 2010, 1, 1-11. Abstract: Two explanatory studies assessed the effects of an intervention on the math problem solving of students with Attention Deficit Hyperactivity Disorder (ADHD). In the first study, students were assessed on a visual task in a high stimulation classroom analog setting with and without the use of a fine motor activity. Results showed that the fine motor activity was associated with more math problems correct. In the second study, students were presented with a visual task with and without auditory distraction. Results showed that the auditory distraction impeded performance but that the fine motor activity mitigated the effects of the distraction. Although the results of these studies are modest, they suggest that fine motor activity may affect the performances of students with ADHD and future research is needed. Early Childhood Development and Care, Vol. 181, No. 3, April 2011, 321-334. Abstract: A resource kit containing information booklets about ASD, selected toys and playthings, and communication aids was developed and evaluated with 29 volunteer mothers supported by service personnel who visited on an average of six occasions. A mix of qualitative and quantitative methodologies was used in the evaluation. Nearly all mothers found the kit helpful to their child, to them personally, and to some extent to the wider family. On post-testing, mothers reported that the child had fewer problems relating to play as a result of using the kit. The child’s relationships with others and difficulties with imitation had also improved. Mothers felt less stressed in their interactions with the child. On average, the mothers had received around 10 hours of home-based support and the costs of the kits were also modest. This approach offers a value-for-money, practical approach to meeting the needs of families awaiting diagnosis and those who have recently been diagnosed. With those words, generations of children were brought up to believe that the best way to learn is by sitting quietly with hands folded, feet on floor and eyes focused forward. Before the middle of the 20th century, people relied heavily on newspapers, books and radio for information and entertainment. Back then, families would gather around the radio to listen to mystery programs like "The Shadow", along this comedy and news programs. International Journal of Applied Educational Studies, Vol. 13, No. 1, April 2012, 19-32. Abstract: We conducted this study to investigate the effect of adding physical activities (sitting on therapy ball versus doodling) on listening comprehension of children with and without attention problems. We used an alternating treatment design to investigate the effects added motor activities, therapy balls versus doodling. Results show that all of the participants answered more comprehension questions compared to the baseline conditions. However , both the therapy ball condition and doodling conditions were equally effective with children. Implication for research and practice are discussed. Dr. Sadler, of Baylor Medical Center, is interviewed on the growing problem of Teen Texting Tendonitis (TTT). Youth are experiencing significant tendonitis and other health concerns due to excessive texting. 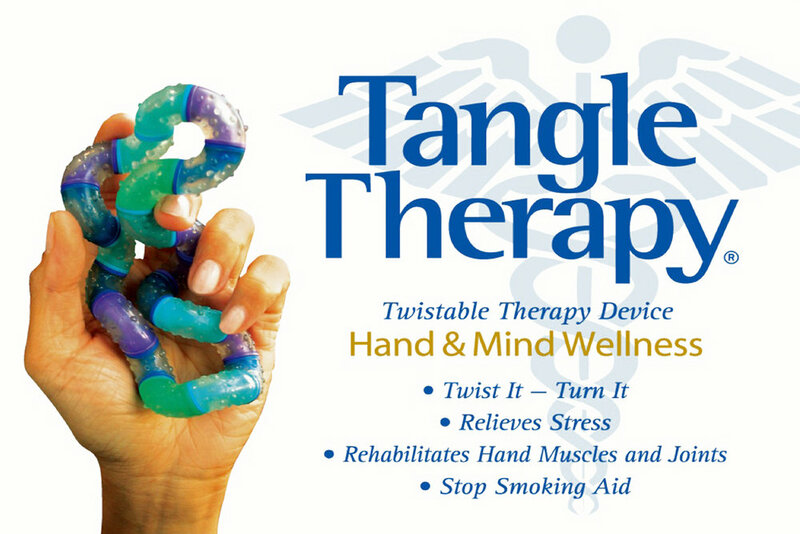 Dr. Sadler prescribes and highly recommends Tangle Therapy and the Tangle Airless Matrix Ball as excellent rehabilitation and physical therapy for hands, wrists, fingers, elbows and arms which have impacts up into the spine and back.